With a growing reputation, we specialize in organizing school tours that meet the requirements of students who seek highly personalized itineraries. Well-known for our quality service, we ensure that the students get real value of knowledgeable travel experience. Our track record goes back to 1999, when we began organizing tours for various International Schools from Hong Kong, England, Australia and the USA to their complete satisfaction. We take pride in our fine-tuned tours that allow students to highlight their Creativity, Activity and Service (CAS) and Interim week to meet the requirement of their syllabus of IB, Cambridge or A ‘level’s through our wide range of programs: treks, wildlife safaris, white water rafting, mountain biking, culture and pilgrimage tours, community work at orphanages and government schools in Nepal with inadequate facilities in remote areas without disturbing the pristine nature of the setting. CAS is also an ideal option to spend vacation in overseas as it provides you the opportunity to assist others, participate and experience a different culture, along with contributing to the communities. Our specialty lies in handling school groups on special missions, keeping in mind the anxiety of parents and teachers when sending children away on such excursions. While the children are in our care, our top priority is naturally, their security. But despite all the precautions that need to be taken, we allow the students freedom to enjoy the spectacular Himalayas and natural beauty at the same time the program enhance their personal and inter-personal development through experiential learning. Increased awareness of their strengths and areas for development. Reflective thinkers – who understand their own strengths and limitations, identify goals and devise strategies for personal growth. Willing to accept new challenges and new roles. Aware of the fact that they are members of communities with responsibilities towards each other and the environment they live in. Balanced—they enjoy and find significance in a range of activities that involve intellectual, physical, creative and emotional experiences. Our well-thought out programs are designed to be challenging but at the same time enjoyable, resulting in a personal journey of self-discovery. For many students, our activities prove to be experiences that are profoundly influential and life changing. You can download following PDF for detailed information on CAS trip. Why CAS Trips with Nepal Sanctuary Treks? Our trips are specifically designed to meet the needs of the students’ score for their Creativity, Activity and Service work. Our guides and staff are well trained, friendly, professional, and responsible, with years of experience in providing customized services. They also speak very good English. They are trained in giving first aid when required and carry a comprehensive first aid kit with them at all times. They are competent and know how to cope with the mountainous terrain and also how to ensure the safety of the students. In case of an emergency, they have the ability to deal with it appropriately. The emphasis is on eco-friendly trips and we provide training to all our staff in order to minimize the environmental impact around the trekking areas. Personalized itineraries and school trips are planned keeping in mind the needs of both the teachers and students. We provide an environment-porter for each organized trek so that all the non-biodegradable items are brought back with them. We take care of our staff/porters by providing enough/ warm equipment and clothes and each of them is insured. We believe in conservation of nature and wildlife, and support the local economy as well as the social and cultural values of the local communities. We follow to the letter, all the rules and codes of ethics set by the travel industry. With safety in mind, we provide PAC (Portable Altitude Chamber), Oxy-meter and satellite phones. Why is Nepal a suitable destination for your CAS trip? Nepal gives each student the opportunity to compare the stark contrast in the lives they lead in Hong Kong with that of locals here. It enables the students to reflect on their own privilegedlifestyle and seriously consider their responsibilities as global citizens. Nepal is blessed with some of the most astounding scenery and landscapes on the planet which provides an ideal setting for any out bound experience. What is the mission behind a trip to Nepal and how will the students benefit? To raise the students’ awareness of their responsibilities as global citizens and to help them realize that they can make a difference. To expose the students to an alternative culture and expand their understanding of the world. To place students in a physically and mentally challenging situation that facilities their personal growth. Why is Nepal a suitable destination for your Interim week? As a destination for high school students, Nepal offers a wide variety of experiences and challenges. Every trip, whether focused on a service objective or an outdoor sport, automatically includes encounters with the culture and people of Nepal. A wide variety of outdoor options are available including week-long trekking, minor mountaineering, white water rafting, bicycling, paragliding, and jungle safari. Service options include visiting schools and children’s homes that can include helping with construction projects or helping students practice English or to set up a computer lab with wireless Internet in a remote school or health center. Nepal, of course, offers a rich opportunity for cultural learning whether sightseeing in the Kathmandu valley, visiting a Buddhist monastery, or eating dal bhat and drinking tea in a village. What is the mission and what benefits do students get from the Nepal trip? Exposing teenage students to the situations of people in communities other than their own is one of the main objectives of Interim trips. This is accomplished through visits to local schools, children’s homes, and if possible, families living in villages and in cities. It is through one-to-one communication with people their own age that realization dawns on them that happiness is not necessarily dependent on material accumulation, social status or level of education. Why is Nepal a suitable destination for your school trip and what is the mission behind the trip? I wanted to run a school trip that involved some type of ‘service’ aspect, where young people from the UK could ‘give’ as well as ‘ receive’. 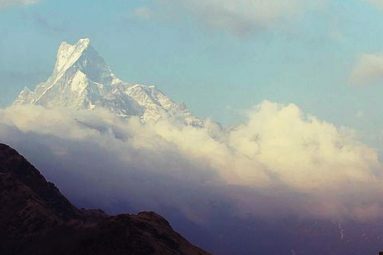 I chose Nepal because it is a most beautiful country with wonderful wildlife and fantastic opportunities for adventure. In addition it is a poor country so there is plenty of opportunity for the service element of the trip. Finally the Nepalese are so friendly and welcoming making it a very ‘ safe’ country to bring young people to. What benefits do students get from Nepal trip? The young people on the trip get to experience a completely different culture. The service element of the trip is to teach in some poor schools and our students are trained in TEFL (Teaching English as a Foreign Language) techniques before departure to Nepal. In the schools our students soon learn that there are a large number of very bright children – in itself this is a lesson to our youngsters who are of the belief that if ‘you are bright you are wealthy’. The trek is a great experience for them all as it builds the group as a team but individually some of those who struggle with the physical aspect of the trek learn a great deal about self-discipline and perseverance. 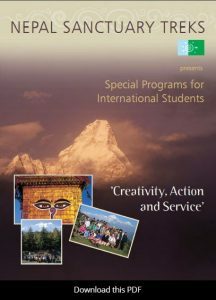 Nepal is the ideal location for CAS Week because it offers the combination of challenge on Creativity, Activity and Service that IB CAS requires. There are few countries that can offer such breathtaking scenery and warm-friendly people as Nepal within an affordable budget and fairly close to home. The local knowledge and length of experience in catering school trips is an important consideration when choosing Nepal Sanctuary Trek as our main operator. I know I can trust the company to adapt the itinerary to the needs of the students and their ability to handle emergencies have been tried and tested. Why is Nepal a suitable destination for your school trip? Nepal is the ideal destination for school trips that focus on incorporating elements of personal challenge along with other adventurous and cultural immersion experiences. Nepal has iconic features, such as the Everest and Annapurna regions, which regularly feature on the bucket lists of travelers worldwide. What is the mission and what benefits do students get from the Nepal trip ? Gazing with awe at the spectacular and diverse beauty of the Himalayas. Exploring with joy the dense tropical forests with its wealth of wildlife. Rafting adventurously down the liquid highway of the Trisuli. Living to the beat of Nepali time, sharing their traditional culture and their customs. Trekking at altitude is challenging and an excellent experience for our students. It taxes them physically and mentally, and it engenders team work. The training for trekking would start back in Hong Kong months before departure, although nothing really prepares the students for up to 8 days of relentless walking, reaching heights of over 5,000M. Equally important of course, is the stunning beauty of the landscape. The awe-inspiring mountains, waterfalls and glaciers; the change in fauna and flora with the change in altitude; the sparse settle ments and the beautiful villages along the way are par for the course on every trek. There is also the thrill of reaching the destination, be it Everest Base camp, Annapurna Base Camp, Khare Lake or over the Thorong La pass. That sense of achievement lives with our students (and staff) for the rest of their lives. The nature of the trek is also special. On our treks we camp, and hence we need the support of a large number of guides and porters who not only bring all the tenting equipment, but also stools, tables, lamps, and in addition, carry our big bags leaving us with just the daypack to worry about. We also have our own kitchen staff responsible for cooking us 3 meals a day along with regular lemonades and tea and biscuits! For a typical party of 30 students and staff, we could have the support of 70 to 80 locals. It makes for a sizable and exciting expedition of the traditional kind! Above all though, it is the people that make Nepal special. Their gentle kindness to strangers, their toughness in adversity, their unique cultures and diversity of religions, and their colourful festivals and celebrations are just some of those characteristics that bring visitors back for more. The chaotic bustle of Kathmandu and the relative tranquility of Pokhara – so much contrast, so much to see! Whether trekking in the Annapurna region or organizing community projects at Katja House, Nepal Sanctuary Treks always provides the highest level of service. Nepal Sanctuary Treks are acutely aware of the inherent risks when taking large groups of school children on such ventures and offer a very personalized service to ensure that the students enjoy a safe and meaningful experience. When trekking they use modern and high specification equipment. Further, Nepal Sanctuary Trek’s long standing relationships with local communities throughout Nepal ensures that trekking trips and community projects are well organized, appropriately resourced and sustainably managed. I have used Nepal Sanctuary Treks’ service for the past six years and highly recommend it. They are perfect for the kinds of experiences we want to offer students. Their local guides are always helpful, courteous and friendly. They clearly enjoy being with the students and openly share cultural insights, Nepali songs and even give Nepali dancing lessons! Arrangements for hotels, local lodges, or camping are great and hassle-free. Local transportation, whether by air, bus or van, is also well arranged and convenient. Nepal Sanctuary Treks have directed our ‘ adventure’ aspect of the trip for many years now and they have always been brilliant. Each year we have had quality guides who cannot do enough for us and we have been looked after really well. Nepal Sanctuary Treks always try to find the best value for money in the travel arrangements, jungle lodges, tea houses and river rafting experience. I would thoroughly recommend them as someone who has now been travelling with young people to Nepal for 15 years. I am Deputy Principal at Island School Hong Kong and for many years the school has organised an annual Himalayan trek using Tulsi’s company. Additionally he organised my own expedition from Kathmandu to Lhasa (Tibet) in 2001. He is also a trustee of an orphanage and school that we at Island School sponsor. Tulsi has been a honoured friend of our school for many years. He can be relied upon absolutely to provide a high level of service. His reputation for honesty is beyond reproach. He is a delight to work with: a real gentleman. I know that if you charge Tulsi with responsibility for organising an expedition into Nepal and Tibet the preparation will be impeccable. We went equipped with equipment to guard against altitude sickness, the drivers and guides were first rate and all the accommodation and food arrangments went according to plan. As far as it possible to guarantee safety in this region, it can be guaranteed by Tulsi. 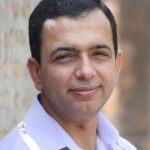 I cannot recommend him highly enough and I am appreciative that you have chosen to use his company as times have not been good for Tulsi and the Nepali travel industry in recent years. Do not hesitate to contact me if you wish to know more. Regards and have a great expedition. I know from experience that you will find this type of adventure awe inspiring. I would like to thank you once again for a well-organized trip. We all had a great time. I am sure you will have some return customers. I specifically would like to thank you for the special consideration you gave to Patrik. Nepal Sanctuary Treks is a terrific guide company! They arranged a recent trek for me for 12 Dartmouth College singers. They had a fantastic time and everything was organized extremely well. Furthermore, it was safe from every standpoint. I highly recommend them and the family owners are great too. helped us and made it such a resounding success. On behalf of everyone in the group, I would like to thank your team for the superb job they did on trek. We were very well supported and looked after. Chandra and his group were amazing. We couldn’t have done it all without them. Thank you once again for your very warm welcome. See you next time. Over the past four years I’ve been leading tours to Nepal for high school students from Hong Kong International School. Since we go to the Pokhara area, we call our group “Annapurna Pranam” or “At the Feet of Annapurna.” Each group of sixteen students and two teachers has focused on visiting schools and children’s homes. Our week-long trips would not be possible without the expertise and experience of Nepal Sanctuary Trekking. From planning before the trips with Prasant and Tulsi to the on-the-spot attention to detail by the Sherpa guides and porters, the organization is smooth and flexible to our needs. We have nothing but praise and gratitude for the professionalism and personal care provided by Nepal Sanctuary Treks. I have been recommending that my friends, my colleagues – and anyone I hear are going there – contact Nepal Sanctuary Treks for any type of visit to fascinating Nepal! Annapurna Pranam 2012: An Annual Visit from Students from Hong Kong International School, Hong Kong. We have used Nepal Sanctuary Treks from the year that it was set up. The owner of the company, Tulsi Gyawali was known to the staff at Island School through the previous company he worked for and we have come to trust him completely. He and his staff are very experienced in catering to the needs of school parties, and their willingness to go the extra mile to look after us has been exemplary and gratefully received through the years. Many of the Sherpas, guides and porters work loyally for the company as they are treated well, and our teachers have come to look forward to seeing those familiar faces year after year. They are a professional outfit of the highest caliber and they are passionate about serving their clients. Over the past four years I’ve been leading tours to Nepal for high school students from Hong Kong International School. Since we go to the Pokhara area, we call our group “Annapurna Pranam” or “At the Feet of Annapurna.” Each group of sixteen students and two teachers has focused on visiting schools and children’s homes. And each time we have tried to help Nepali students gain access to sources of information our students take for granted. We have provided laptops, Internet service, funds for computer labs, and part of the salary for a full time computer teacher. It is a mere drop in the bucket, but perhaps a few students have benefited. Our week-long trips would not be possible without the expertise and experience of Nepal Sanctuary Trekking. From planning before the trips with Prasant and Tulsi to the on-the-spot attention to detail by the Sherpa guides and porters, the organization is smooth and flexible to our needs. We have nothing but praise and gratitude for the professionalism and personal care provided by Nepal Sanctuary Treks. I have been recommending that my friends, my colleagues – and anyone I hear is going there – contact Nepal Sanctuary Treks for any type of visit to fascinating Nepal!